This two-year-old male kākāpō is clinging to the twigs of a poroporo bush as he reaches for ripe fruit. 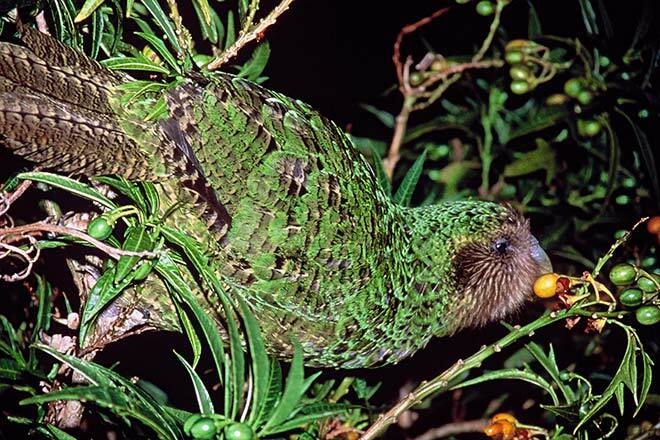 Kākāpō eat a wide variety of foods from at least 25 plant species, but tend to breed only in years where there is a bumper crop of rimu fruit, beech seeds or other nutritious food. They are night foragers – this picture was taken at 11 p.m.